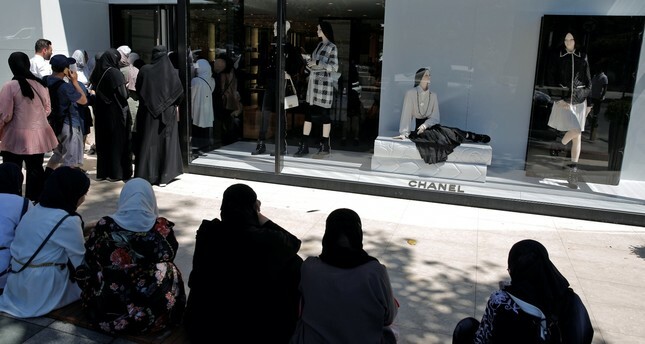 Tourists wait to enter a Chanel store in Istanbul. The rise in exchange rates has led to long queues for stores that sell luxury brands in shopping malls, crowded particularly by Chinese tourists whose spending has exceeded the retail expenditures of tourists from the Gulf in July. Coupled with Qurban Bayram (Eid al-Adha) shopping by Turks, store turnover has increased by nearly 50 percent. Adil Işık, CEO of the Adil Işık women's clothing store chain, noted that turnover has surged by at least 30 percent thanks to shopping by tourists and that shopping in Anatolia remains similar to last year's Eid shopping, with no decline. Underlining that shopping for local brands instead of for foreign luxury brands will bring foreign exchange to the country and reduce the current account deficit, Işık said: "Shopping malls should have more space for local brands. People's shopping behavior should be local since we have no other way out." Burak Celet, Desa board member and general manager, said that the increased turnover has pleased retailers especially over the weekend, adding: "We have broken turnover records in our stores located in shopping malls in big cities that attract a great number of tourists. Despite this, we are still frustrated because some of the giant shopping mall chains are still applying hire rates based on daily exchange rates without mercy." Retailers said that they expect a move from the government as soon as possible to end the currency terror, stressing: "They make out invoices based on the daily euro rate. The majority of those who do this are foreigners." İstinyePark General Manager Uğur Berk indicated that Far Eastern tourists, following Middle Eastern tourists, are taking great interest in shopping malls, with spending by Chinese tourists rising by 130 percent and exceeding spending by Middle Eastern tourists in July. "Luxury brand products that are not discounted as a result of recent economic developments have not yet been updated despite the increase in exchange rates last week. Thus, prices have been down by 30 percent compared to abroad. Besides, there has been intense demand for our local brands," Berk said.